This material was developed by an online open-content collaborative of individuals and groups working to develop a common resource for the profession using an online wiki. The structure of the project allowed anyone with an Internet connection to alter its content. As such, it does not represent the official positions of the Modern Language Association. The wiki is still available for editing. So you expect to be evaluated on the grounds of your new media work, whether instructional, service or research. Here is a list of some of the types of materials you may want to keep in order to make your case. Letter of job offer, letter of appointment and related correspondence from chair: Correspondence around the hire can be useful to show what you were hired to do. Further, if you discussed expectations in the correspondence it can help committees evaluate you in light of the expectations. In general committees will respect the terms of an appointment where they were clearly discussed, even if they don’t share the original goals. Documentation and Minutes from Web Committee: If you are expected to manage the departmental web site or some other organizational web site then you should keep key documents that show the extent of the work and the challenge of the work. For example, if you lead a major redesign you should keep key documents that describe the process. You can also keep minutes from meetings and training materials you might have prepared. Documentation and Minutes from Technology Committee: In much the same way as documenting work on a web site, you should document significant work on a technology committee. If you have to manage a lab that could involve all sorts of documents from internal support requests, job ads for staff hired, to policy documents. University Committee Reports: If you are the designated humanist with computing expertise you may end up on university technology committees or task forces charged with developing reports for the university. These can end up being significant documents build on research and applying knowledge to the university context. Instructional Design and Review Documents: If you want to demonstrate pedagogical innovation or scholarship you should formally design that project and document that. Then you should weave into the project forms of review. Most universities will have a centre for teaching and learning that can help you design in forms of review. For example, it is common for such centres to be able to arrange a peer evaluation of your teaching distinct from that of your department. Better organized centres will be able to recommend and adapt other types of assessment from running focus groups to managing enhanced student surveys. Such an assessments, though usually formative, do at least provide narrative depth to your file that can help a committee understand your teaching innovation. Course Outlines and Instructional Materials: Many departments will require that you deposit your course outline, but you may also have materials developed online that supplement the outline. Have you developed special web materials for your teaching? How can you document these materials? One obvious way is to save representative web pages and to print them out. In cases where the instructional materials are interactive you may want to supplement the screen printouts with narrative that explains what users can do. Imagine you were creating a tutorial to the materials or an “about” for the site – what would you put in to help others understand what it does? Internal Grant Proposals and Responses: Chances are that if you have developed complex computing materials you will have requested support from units in the university whether it is your department or an internal university competition. Often the proposals to these units are the closest you have to something that is reviewed. Especially when you are requesting funding or resources support your proposals are reviewed competitively and should you get the funding you can argue that for project work that constitutes a form of review. Therefore you should the proposals and the responses to document that you are submitting your ideas for critique and competitive review. Letters of Thanks or Support from Colleagues: When you complete service tasks for certain organizations you may get letters of thanks or letters acknowledging your contribution that can provide background information to claims that certain service tasks have a high profile. Keep these letters, they can help provide context to service roles that are significant. Terms of Reference for Boards: You may be asked to sit on prestigious editorial boards or panels for innovate organizations that involves more work than expected. Gather documents about the organization and the expectations of the board. You can also summarize the work you did. How can you summarize information about a new media work so that your committee can understand the context. Here is a fictional example drawn from a real case. It is followed by a bullet point summary of the salient items of information included. My article, titled “Teaching in Second Life: The Garden of Games,” co-authored with Jane Philodorus was published by the online journal Digital Learning at <http://www.philosophi.ca/pmwiki.php/Main/TheSculptureGardenOfHistoricalComputerGameCharacters>. This article of approximately 23 pages length describes the design and pedagogical assessment of an assignment in a games studies course where students developed 3D models of historic video game characters. We found that the assignment significantly increased engagement with the course and provided students a better understanding of virtual worlds. Also included online is an appendix of approximately 30 web pages of lesson materials including the guidelines for training students in Second Life modeling. I taught the course, directed the project and wrote the article in collaboration with Jane Philodorus of the Centre for Teaching Learning. Philodorus ran the Second Life 3D modelling training for students, designed the assessment and analyzed the results of the assessment survey. My contribution can therefore be estimated at 75% and that of Philodorus at 50%. The journal Digital Learning, while new (it was started in 1998) has a wide readership and a rigorous peer review process. 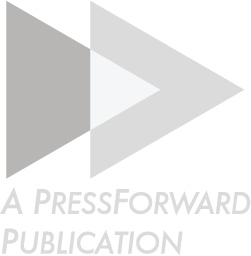 The review process is documented online as is the Editorial Board (which includes leaders in the field like Wilford Wright and Wardrip Aarseth). According to the Editor the journal rejects about 70% of the submissions. The journal is widely read with over 10,000 visitors per day and a print copy of all the articles is archived at five libraries around the world. The article has already be blogged by academic blogger George Rockwell in almost.theoreti.ca where he notes that “the authors did their assessment right and at arm’s length rather than just charming the students with a questionnaire. Bibliographic information. Provide bibliographic information in a consistent manner following guidelines like those of the MLA Style Manual and Guide to Scholarly Publishing. Provide information about the extent of the online article so people can compare it to print article length. Estimate the number of pages if this were to come out in print. Explain the paper so that someone with less experience can understand what the work does. You can provide screen shots if the would make a difference. Information about Authorship Contribution. There is nothing wrong, in principle to listing contributions that add up to more than 100% if by that what you mean is what percentage you worked on. Just be consistent. In this case there is more to the project than just writing the article. Even where you wrote the entire published article reporting on the project you should include as co-authors any who contributed significantly and intellectually to the project. That includes programmers who exercised creative control and instructional designers. Provide information and links to information about online journal’s review process and their organizational structure. Mentioning members of the editorial board can help committee members position the journal. Provide information about traffic to the web site if it is available. If the article is quoted, blogged, or reviewed by another reputable source you can mention that too. This is the December 12, 2012 version of “Documenting a New Media Case.” The wiki is still available for editing. The Evaluation Wiki of the Committee on Information Technology is an online open-content collaborative of individuals and groups working to develop a common resource for the profession. As such, it does not represent the official positions of the Modern Language Association.